Author’s Note: This is an update to my previous post regarding HB217 that is working its was through the Utah State Legislature. For those of you who didn’t see my special edition of Boogers on the Wall on Sunday, I wrote an open letter to the Utah State Fire Marshal regarding the proposed amendment to the Utah State Fire Code that would outlaw sky lanterns. 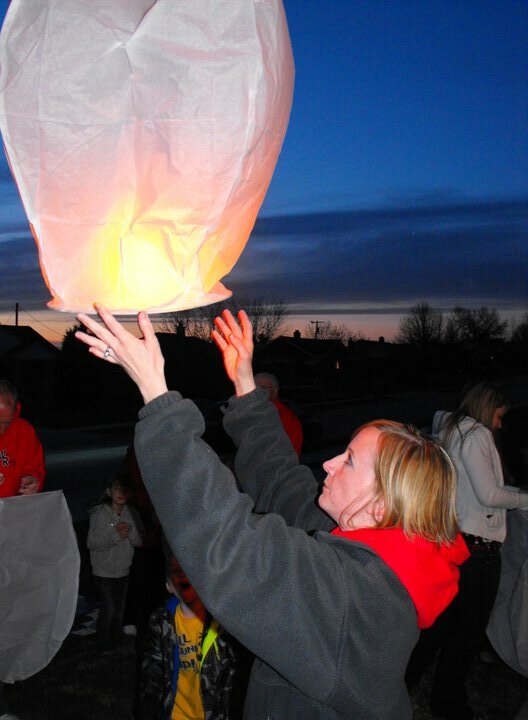 We have sent sky lanterns to Luca each year on his birthday. It is such a peaceful, beautiful way to remember my little angel baby on the anniversary of the day I delivered him. But a proposed amendment to the Utah State Fire Code would classify the lanterns as unattended fires, therefore rendering them illegal. I have anxiously been watching and waiting for news from the House of Representatives about the proposed amendment – HB217. I signed up to receive email notifications when anything changes. I didn’t know if I should cry or jump up and down with joy! It’s amazing what little things make a grieving mother’s day. The House of Representatives standing committee on Business and Labor gave the bill a favorable recommendation yesterday. I’ll keep watching and waiting for updates. I know the bill isn’t finalized and things can still change, but the possibility of being able to continue a sentimental tradition on the day my baby flew to heaven has me overjoyed! Congratulations! I am glad you can keep up your tradition. Thank you for the update. At least I know I’ll be OK in using these lanterns for my project. I’ve lit over 100 lanterns and the only one at even came close to light on fire was the very first one right in front of me in a tree next to me. Lesson learned, these things are perfectly safe when used the right way in the right conditions. Hi Natalie, thank you for your post. I have looked all over the internet for understanding about this law in Utah. Do you know what the final law is now? Are the sky lanterns still legal in Utah until summertime? Hey Kelsey. Here is a link to the amendment. As far as I can tell they determined to let individual areas control when or if to ban lanterns and they can only do that under specific circumstances. What was the ending result in this? I have been trying to read the bills all day and can’t seem to wrap my head around comprehending them. Hahaha! The reason I ask is that I too had a stillborn and every year we do a balloon release on her birthday at her grave (since 2009) and last year I did a lantern as well. Then when I let my family know about my plans to do one again this year in a couple weeks my brother remarked with “I think those are illegal” so I started researching. I am so sorry for your loss. It is not anything I would wish on anyone. We are coming up on my angel daughters 7th birthday and it doesn’t get any easier. Let me know what you know on this. However, I think that people wanting to use the lanterns still need to make sure conditions are ideal. One year we couldn’t do any on Luca’s birthday because it was so stormy and windy. We tried one and it skidded across the driveway and scared us. We make sure we are in a large open area on a non-windy night when we do them. I am so sorry your your loss too. No mother should have to bury her child.